ShareCG: CG Guy - The Tinkerbox iPad App from Autodesk Rocks! I downloaded Tinkerbox to my iPad last night and was so engaged that I didn’t get to sleep until after 2AM. Tinkerbox is not only fun, but helps improve the spatial, logical and creative sides of your brain. 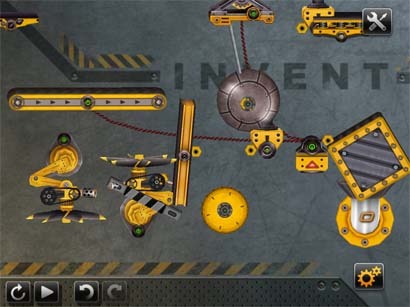 You select from a wide assortment of active elements like switches, balls, spring-loaded bumpers, winches and much more and use these to solve mechanical puzzles or to create your own Rube Goldberg masterpieces. All elements simulate real-world physics, so a string behaves like a string, balls roll and bounce, and items swing from winches just as if they were in the real world. A picture is worth a thousand words, and a video is even better. So, enjoy this short video overview and if you’re reading this on your iPad – Get this app! AVATAR, Star Trek, and District 9, oh my! This entry was posted on Wednesday, November 16th, 2011 at 5:24 pm. You can follow any responses to this entry through the RSS 2.0 feed. You can leave a response, or trackback from your own site.